The ultimate dry lips treatment. A simple and effective formula with short list of ingredients to help protect and repair chapped lips. 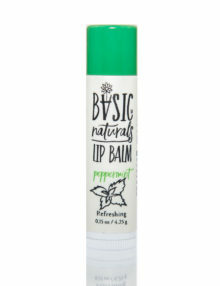 Natural Lip Balm – Peppermint – beeswax and essential oils to seal in moisture and protect your lips all day long. Peppermint has natural cooling properties which makes it ideal for hot, dry days. How to use: Apply as needed throughout the day to dry lips. Store in cool, dry place. Basic-Naturals Lip Balm is safe for all ages. Basic-Naturals products contain no petroleum, artificial fragrances and perfumes, parabens, or harmful chemicals.